Our family really loves popcorn! Seriously, we buy our popcorn kernels in a 20lb bag and it lasts about a year. 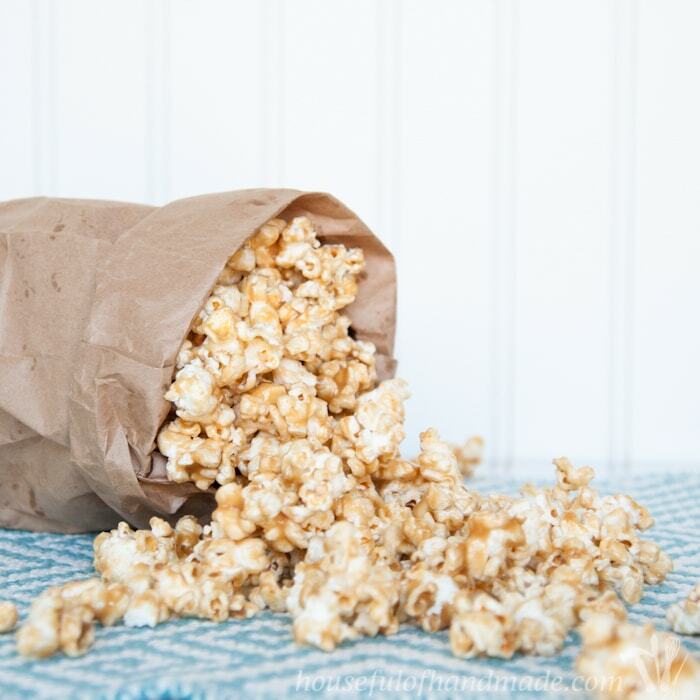 If the kids need a snack after school = Popcorn! 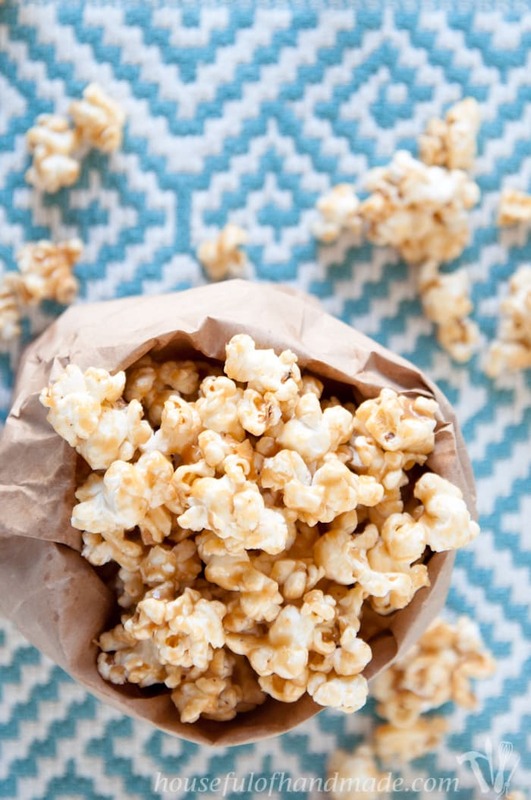 Need a sweet treat after dinner = Popcorn! Movie Night = Popcorn! Bored = Popcorn! Okay, maybe not overtime I get bored, but I do like to entertain myself by cooking and popcorn is the most requested thing by the husband. So now I get to share our love of popcorn with you over the next 14 days. I’ll be sharing our favorite recipes and some new ones I’ve been working on. But I am starting with my personal favorite, this chewy peanut butter caramel popcorn. I have to admit, I may have ulterior motives for sharing our popcorn recipes. For the last few months my sister has been living with us while she was preparing to move out of state. While staying with us, she learned to love our regular popcorn nights. I am not the kind of person to be happy with the same food over and over, so I’ve been getting creative with my popcorn recipe. I change it up all the time. My sister asked me where I had written down all the recipes I’d created. Well, I hadn’t written them down anywhere. They are all stored in my brain, or maybe a few ingredients scratched in the comments of our family recipe book. Instead of just writing them down for her, I decided to make it a fun event and share them with you too! So 14 days of popcorn was born. I hope you will join me everyday until Valentine’s Day for a new treat. There will be lots of caramel and sweet popcorns, and a few savory ones as well. But today I am sharing my all time favorite recipe! I love a good sweet caramel corn, but I prefer something that isn’t too sweet. 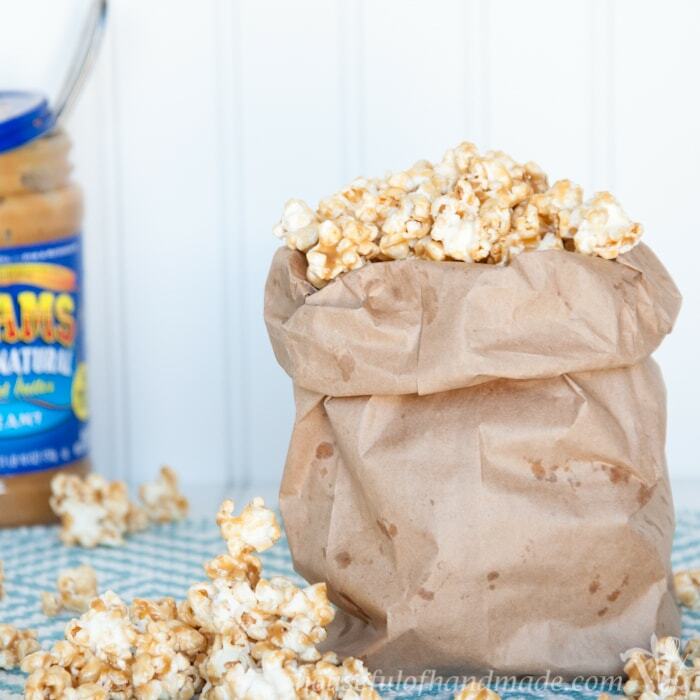 This chewy peanut butter caramel popcorn is just that. A little sweet, a little nutty, a little salty, and a whole lot of chewy! I could eat the entire bowl, it’s that good. But even better, it is super quick and easy to make. 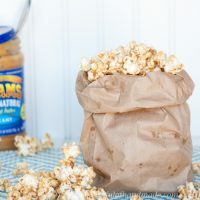 This recipe was created by adding peanut butter to the classic chewy caramel popcorn recipe that my mom had been making for us for as long as I can remember. The recipe can be put together in just 10 minutes! That’s why it’s our families favorite after dinner snack. The caramel on this popcorn is thick and chewy. I like my caramel popcorn to be more popcorn than caramel so I do a large batch, 1 cup of unpopped kernels per batch. It make a huge bowl of chewy peanut butter caramel popcorn for us to enjoy. And I feel a little better about eating a lot of caramel popcorn when I know the caramel isn’t too thick. If you like your caramel thicker, just use less popped corn in the recipe. Now it’s time to go enjoy some more popcorn! 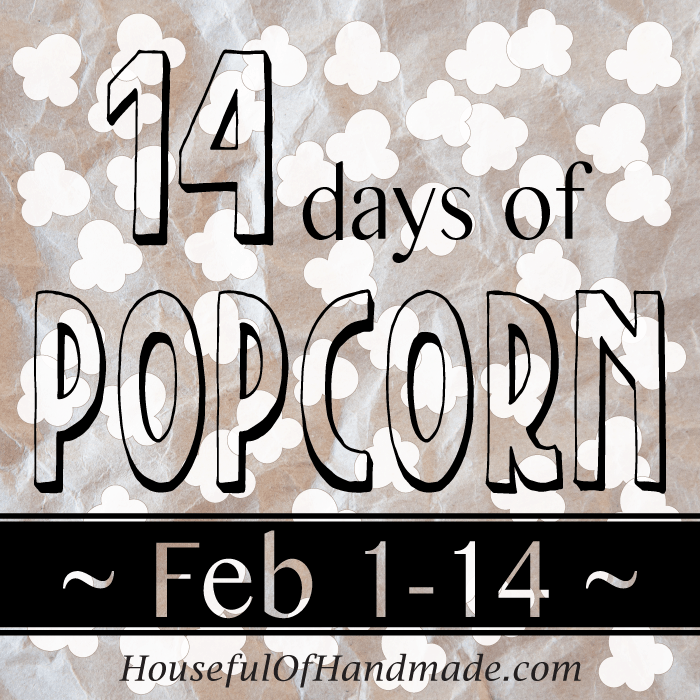 Day 1 of 14 days of Popcorn I am sharing my favorite caramel popcorn ever! 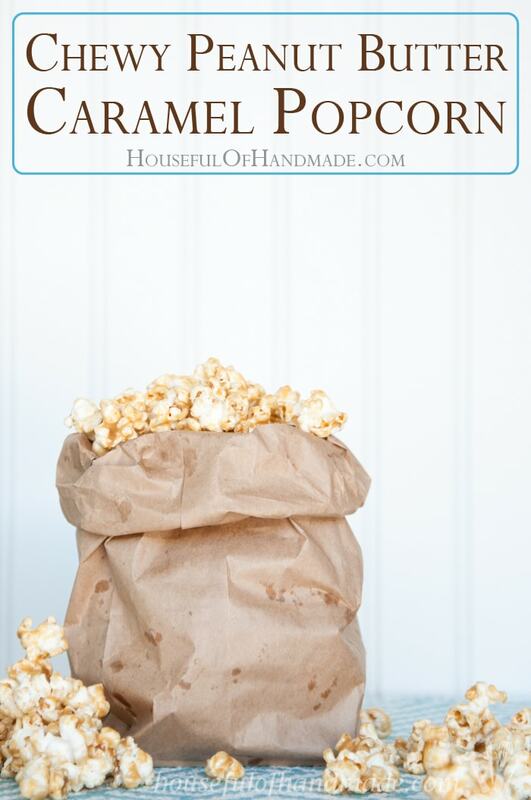 I love the sweet, nutty, and slightly salty flavor of this chewy peanut butter caramel popcorn. If your peanut butter is refrigerated, warm slightly in the microwave. Combine butter, sugar and corn syrup in a small saucepan. Bring to a rolling boil and boil for 3 minutes, stirring frequently. Remove caramel from heat and stir in peanut butter and vanilla extract. 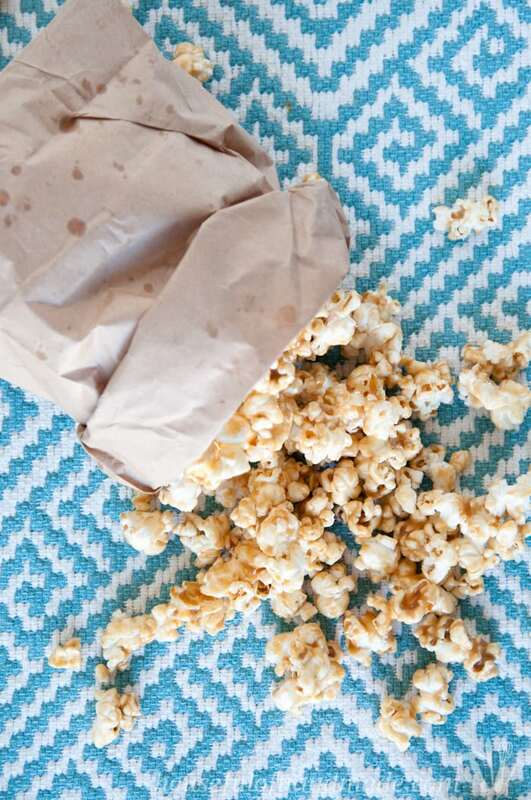 Pour peanut butter caramel over popcorn and stir. Add salt to taste (optional). Stir until all kernels are evenly coated and caramel is cool to the touch. I’m linking up to some of my favorite Link Parties. I love peanut butter, and use it in many ways, so far popcorn hasn’t been one of those, what a great, yummy idea! I love peanut butter too! This popcorn is so good, I hope you get a chance to try it. YUM! Popcorn is one of my favorite snacks when I’m munchy lately. Adding peanut butter sounds like such a good idea! Peanut butter in the popcorn is so good! I hope you try it.